We’d love your help. Let us know what’s wrong with this preview of The Demon Conspiracy by R.L. Gemmill. An orphaned sibling trio is taken in by a Virginia family and their lives may finally be normal again. They become trapped deep within a cave and witness a conspiracy between big business and the demon nation that promises to rid the world of humans. When telepathic teen, Kelly Bishop, tries to expose the plan to a disbelieving world, she and her family and friends are hun An orphaned sibling trio is taken in by a Virginia family and their lives may finally be normal again. They become trapped deep within a cave and witness a conspiracy between big business and the demon nation that promises to rid the world of humans. When telepathic teen, Kelly Bishop, tries to expose the plan to a disbelieving world, she and her family and friends are hunted by a demon death squad. The good news? The kids made a video of the entire event. The bad news? The video may be lost in the demon-infested caves, and nobody believes their story. The Demon Conspiracy is the origin of a multi-book series of apocalyptic thriller novels. If you like nightmares, conspiratorial thinking, deep mystery and unforgettable characters who are forced to the frontlines of a terrible struggle, then you’ll love R. L. Gemmill’s brilliantly visual look at the doom of modern civilization. Fans of Harry Potter, Divergent, The Hunger Games and Miss Peregrine’s Peculiar Children will love The Demon Conspiracy Series! Face the terror TODAY! 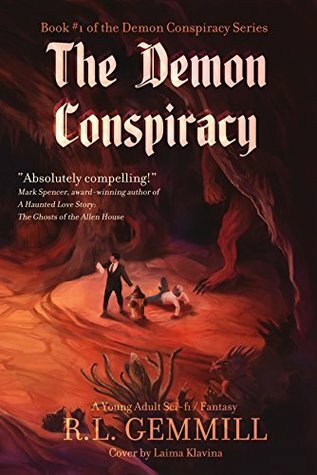 To ask other readers questions about The Demon Conspiracy, please sign up. This was captivating! These poor kids live through tragedy after tragedy, discovering new things about themselves along the way. The writing was smooth for the most part, but the characters were wonderful. The relationships between the sibling felt genuine, and I really enjoyed it. The monsters were properly terrifying, and I stayed engaged for the entire journey. A really great start! If you like demons and paranormal stories, you'll probably enjoy this. Extremely entertaining and well written. Really engaging characters. I can't wait to read more. Jon Bishop (10, son/brother) woke up & he was in pain. Kelly Bishop (6, daughter/sister) said they had been in a serious car wreck. Travis Bishop (3, son/brother) was pulled to safety. Mr. Bishop (husband/father) had a gash in his head & was not moving. Mrs. Bishop (wife/mother) had died at the scene also. BOOM! The van ignited n fire. Fast forward, Chantilly, VA. Franklin MS. Kelly (narrator, telepathic) was OK with the foster parents: Angie McCormick (40, wife, athletic, stay-at-home mom Jon Bishop (10, son/brother) woke up & he was in pain. Fast forward, Chantilly, VA. Franklin MS. Kelly (narrator, telepathic) was OK with the foster parents: Angie McCormick (40, wife, athletic, stay-at-home mom), & Chris McCormick (40, husband, Chantilly HS English teacher), who took all 3 of the kids in. Melissa Godwin talked Kelly into playing against Donnivee Fox (girl, bully) in the Halloween Classic Open Chess Tournament. Front Royal, VA. Crystal Creek Park. Ned Taylor (P/T Park Ranger) was very upset because someone had graffitied Pandora’s Cave. Ripper (Eric’s black Lab/German Shepherd mix) was barking his head off. Ned went to investigate. Melinda Laarz (40, head Park Ranger) was now acting as a tour guide. Angie, Chris, Jon, Travis, Kelly, Anton Edwards (42, A/A, Chantilly HS English teacher), & Dr. Mark Parrish (50+, microbiologist professor, P/T HS chemistry teacher) were quite excited. Later, the teens got separated from the adults. The creatures (demons) they encountered were all unique, quite different & their color tone varied. Chris’s had broken his leg. “Knnsylk.” What kind of language was that? Travis had his camcorder on. An unusual 3.6 Richter scale Earthquake had occurred. A S&R team, law enforcement, firefighters, EMT’s & a whole lot of other PPL were sent out to look for the missing PPL. Will they all be found? Who are & how many Doug’s are there? I am a retired ES MH crisis/school social worker not a psychologist, & I am not under the umbrella of the ASA; so, I don’t think there would be any adverse-affects for a MS teen. A very awesome book cover, great font & writing style. A very well written MS book. It was very easy for me to read/follow from start/finish & never a dull moment. There were no grammar/typo errors, nor any repetitive or out of line sequence sentences. Lots of exciting scenarios, with several twists/turns & a huge set of unique characters to keep track of. This could also make another great MS age movie, an animated cartoon, or better yet a mini TV series. Wish If you would have had pictures. That said I will only rate it at 4/5 stars. The Bishop children lost their parents in a horrible accident. They are brought together by their foster parents after years of separation. Their foster father plans a trip to Pandora's cave for himself and the family. After an underground earthquake shakes up the trip and injures their foster father, the children are dropped down and find demons meeting about destroying the world. While they capture this on video, they need to get help and find a way out. Kelly and Travis are trying to get out The Bishop children lost their parents in a horrible accident. They are brought together by their foster parents after years of separation. Their foster father plans a trip to Pandora's cave for himself and the family. After an underground earthquake shakes up the trip and injures their foster father, the children are dropped down and find demons meeting about destroying the world. While they capture this on video, they need to get help and find a way out. Kelly and Travis are trying to get out with demons on their heels. Oldest brother Jon and foster father Andy escape from the caves but something is wrong, they both seem to have missions and nothing can stop them. I quickly got drawn into the story. it is meant. I think. for a younger reader than me. but I loved it! I was upset when Jon and Chris did a personality change. and that Donivee is a brat! I had to recommend to my library that they purchase the set so I can read what happens in books 2 and 3. I received this book for free in exchange for my honest and unbiased review. I read the book from cover to cover and formulated my own opinions. to keep the three main characters running until the last page. I can honestly say that it was awesome. While geared towards ya, adults can also easily get into the story. Demon Conspiracy is action-packed with an excellent storyline. You are seriously missing a great read if you pass on this one. A family goes caving and discovers that the cave is infested by demons. The main story is told by Kelly Bishop, an eighth grader in the family, who happens to be telepathic. The strange part begins when all of the people that come out of the cave after going in to rescue the ones that didn't get out after an earthquake, all say the same thing. "But I have much work to do. I work hard and fast.” The demon names are funny and interesting enough by themselves. Lipsludge, Klawfinger, Grund, Seven-eye A family goes caving and discovers that the cave is infested by demons. The main story is told by Kelly Bishop, an eighth grader in the family, who happens to be telepathic. The strange part begins when all of the people that come out of the cave after going in to rescue the ones that didn't get out after an earthquake, all say the same thing. "But I have much work to do. I work hard and fast.” The demon names are funny and interesting enough by themselves. Lipsludge, Klawfinger, Grund, Seven-eyes, and Tentacles. The opening statement of the story draws you in immediately with a sense of danger. The intrigue continues on a steady pace as you are sucked into this epic tale of demons and mystery. The narrator is believable and her actions are typical of an eighth grader. I held my breath as I read the scary parts and was also grossed out by the visual descriptions of other scenes. I felt anxious for the characters in this book as they escaped danger repeatedly. I could easily relate to the physical pain and anguish that the characters went through as they were tossed about by the demons. Very entertaining. Easy to visualize what is going on. Definitely recommend it.